Earlier this month, Google Code-in, a contest introducing 13-17 year olds to open source software development, finished up with really exciting results. We had 334 students from 36 countries complete 1,925 tasks in the 7 week contest. Students worked with 10 open source organizations on coding, documentation, training, user interface, research, outreach tasks, and quality assurance tasks. 58.7% of students completed at least 3 tasks in the contest. This year there were 5 countries who for the first time had students complete tasks in Google Code-in: China, Kenya, Kuwait, Trinidad and Tobago, and Uruguay. 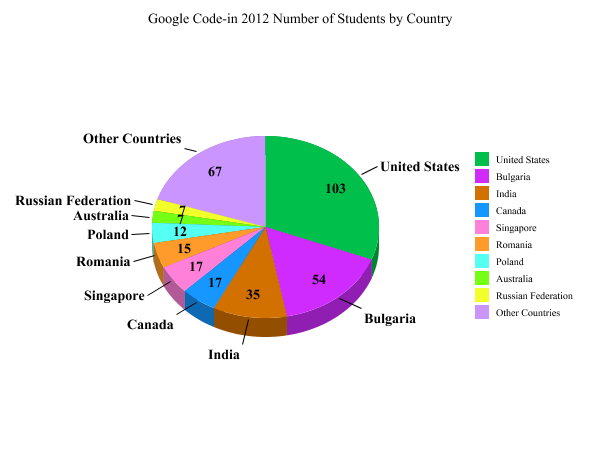 The 5 schools with the most students completing tasks in Google Code-in 2012 are listed below. - Technical School Electronic Systems (associated with Technical University- Sofia) in Bulgaria had the most students participating in the contest for the second year in a row with 44! - Dunman High School in Singapore had 13 students participate in this year’s contest (only 1 student from all of Singapore participated last year). There were 174 dedicated mentors from 40 countries guiding students throughout the contest. This year we had mentors from a few new countries including Macedonia, Panama, Paraguay, Uruguay, and the Slovak Republic. 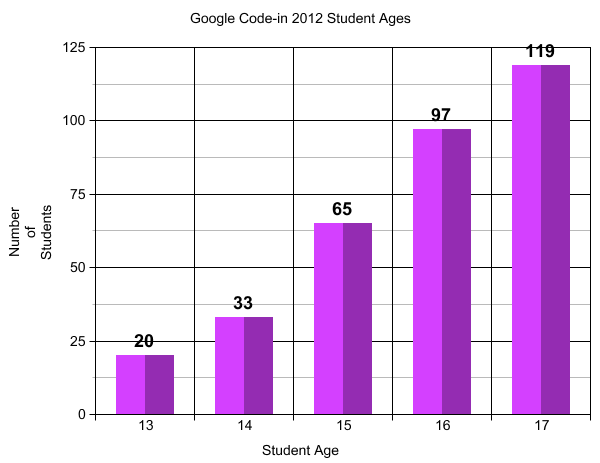 A huge thank you to all of the students, mentors and organization administrators who made Google Code-in 2012 a success! And thank you to all the parents and teachers who encouraged students to learn more about open source software development! Stay tuned to this blog for the announcement of the 20 Grand Prize winners on February 4th.